I went for a brief walk in Chinatown with a friend last August and captured this young man pulling an overloaded cart as I was about to sit down on a bench. Carts like these are the lifeblood of businesses in this district. It also appears most of these workers appear to be minors or out-of-school youth, too young to have to endure heavy labor and should be in school. “Naramdaman ko yung hirap” (I felt his hardship), was one of the most heartfelt comments I received from this, otherwise the image lacked a lot in composition and framing according to a majority of those reviewed this. I would agree with them all, I took this image in a split second without considering the framing, there was a wall against my back which prevented me from backing away further and I was too big to get it from a really low angle. Taken with a Sony A6000 and a Leica Summicron-M 1/2:35mm ASPH 35mm lens at 1/1000s f/4 ISO 3200.See image on Flickr for EXIF. Posted originally on myInstagram. Filed under Street Photography. 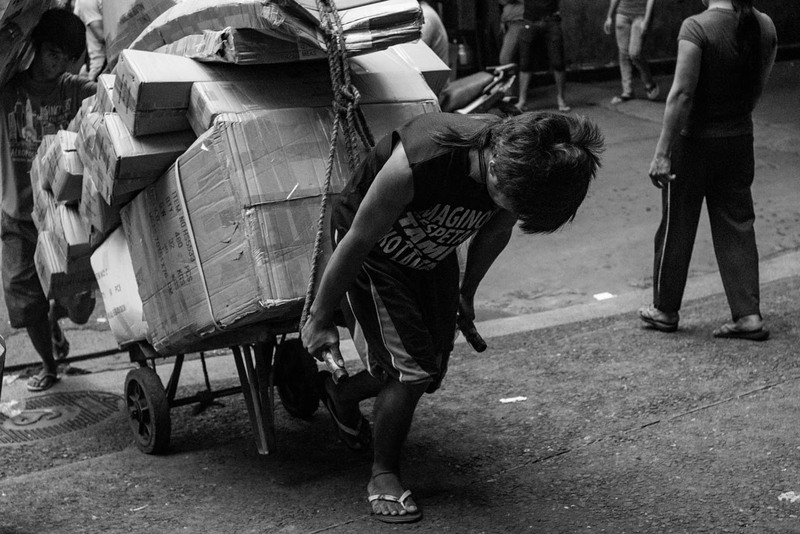 Tagged as 35mm, Binondo, Black and white, Child Labor, Chinatown, Leica, Sony A6000, Street Photography, Streets of Manila, Summicron.